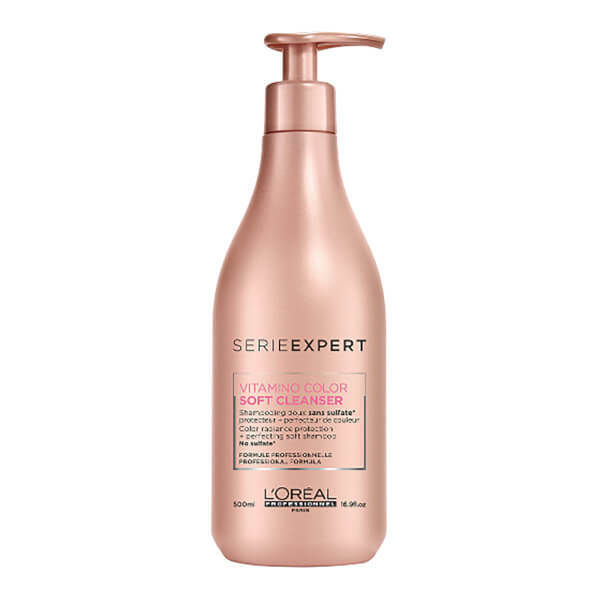 Enhance colour and shine with L'Oreal Professionnel Série Expert Vitamino Color Soft Cleanser, a sulphate-free shampoo that transforms colour-treated hair. Lathering into a creamy mousse upon contact with water, the formula works to eliminate impurities, excess oil and product build-up whilst replenishing deep hydration. The brand’s A-OX complex creates a protective veil around each strand, sealing in colour and infusing the hair fibre with a rich gloss. Expect vibrant and healthy-looking results. Aqua / Water, Sodium Cocoyl Isethionate, Disodium Laureth Sulfosuccinate, Sodium Lauryl Sulfoacetate, Sodium Lauroyl Sarcosinate, Cocamidopropyl Betaine, Glycol Distearate, Glycereth-26, Decyl Glucoside, Sodium Isethionate, Coconut Acid, Ppg-5-Ceteth-20, Divinyldimethicone/ Dimethicone Copolymer, Polyquaternium-7, Sodium Chloride, Amodimethicone, Polyquaternium-10, Propylene Glycol, Peg-55 Propylene Glycol Oleate, Carbomer, Linalool, C11-15 Pareth-7, Benzoic Acid, Laureth-9, Glycerin, Limonene, Trideceth-12, Geraniol, Benzyl Alcohol, Sodium Benzoate, C12-13 Pareth-23, C12-13 Pareth-3, Hydroxypropyltrimonium Hydrolyzed Wheat Protein, Hydrolyzed Vegetable Protein Pg-Propyl Silanetriol, Wheat Amino Acids, Ci 60730 / Ext. Violet 2, Methylchloroisothiazolinone, Hydrolyzed Soy Protein, Methylisothiazolinone, Hydrolyzed Oats, Citric Acid, Benzophenone-4, Helianthus Annuus Seed Oil / Sunflower Seed Oil, Fusanus Spicatus Wood Oil, Tocopheryl Acetate, Ascorbic Acid, Helianthus Annuus Seed Extract / Sunflower Seed Extract, Camellia Sinensis Leaf Extract, Melanin, Rosa Centifolia Extract / Rosa Centifolia Flower Extract, Aloe Barbadensis Extract / Aloe Barbadensis Leaf Extract, Sodium Hydroxide, Parfum / Fragrance. C167519/1.